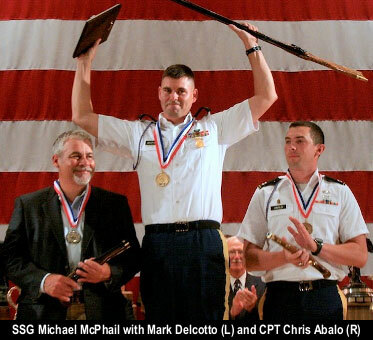 Congratulations to USAMU member SSG Michael McPhail, winner of the 2011 Smallbore Rifle Prone Championship. SSG McPhail won three matches and took the 1st Daily 1200 Aggregate as he shot consistently throughout the week to finish with 4796-401X. Coming in second place overall was Mark Delcotto with a 4796-380X and CPT Christopher Abalo, SSG McPhail’s teammate on the AMU, finished third with a 4795-388X. Held July 24-29, the Smallbore Rifle Prone Championships are a part of the NRA National Rifle and Pistol Championships held at Camp Perry, Ohio each year. Comprised of a Metallic Sight and Any Sight championship, competitors take 480 shots over the course of 12 matches from distances of 50 meters and 100 yards to determine who will take home the Critchfield Trophy. Paul Nordquist shot a 4796-371X to match McPhail’s point total and secure the title of Any Sight Only Champion. Renowned shooter Nancy Tompkins won the High Woman award with a 4794-375X. Reya Kempley shot second (among women) with a 4794-352x and Sarah Beard of Texas Christian University took third with a 4790-351x. Kempley also won the Metallic Sight Championship with her aggregate of 2400-182x. Share the post "SSG Michael McPhail Wins Smallbore National Championship"
With interest growing nationwide in target shooting and owning firearms for home and personal defense, the need for top-notch shooting ranges has never been greater. Recognizing this, in 2011 the National Shooting Sports Foundation, the trade association for the firearms, ammunition, hunting and shooting sports industry, has awarded $435,000 in grants to 22 ranges nationwide. The NSSF Range Grant Program assists qualifying shooting ranges in their efforts to introduce newcomers, re-activate lapsed shooters, encourage active shooters to try another shooting discipline, and promote shooting sports activities among all age groups. For the 2011 funding period, NSSF received 64 proposals requesting $2.8 million in grants — an all-time high. Since it was started in 2008, the NSSF Range Grant Program has granted $1.17 million to 46 ranges nationwide. “We saw a lot of growth in the applications for range grants this year,” said Melissa Schilling, NSSF manager of recruitment and retention. “We believe range operators nationwide are beginning to understand what a great opportunity this is[. ]” The NSSF seeks to create “models of success”, so that effective grant-assisted pilot programs can be adopted by other facilities. CLICK HERE for case studies of programs that have received funding in prior years. Share the post "NSSF Awards $435,000 in Grants to Shooting Ranges"